We love our new rain barrel. We’ve been in the market for one since spring and finally decided on the Kyoto 75-gallon barrel made by Koolatron, a Canadian company with warehouses in the states and elsewhere. It didn’t cost an arm and a leg and the barrel is is able to withstand extreme temperatures that we occasionally have in our temperate zone. It came well packed and ready to use. I pulled it out of the box and at 18 lbs., I could lift and easily carry it to its chosen location. At this time, there is only one color available: sandstone. 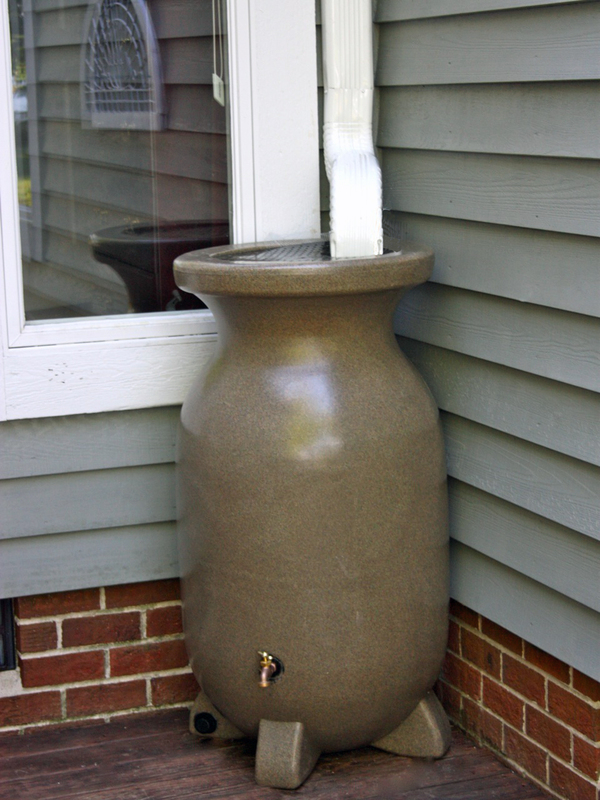 No rain barrel is particularly lovely but this one works for us. The 75-gallon capacity is the primary reason for selecting this product. We diverted our gutter directly into the barrel and I attached a net to the end of the gutter for easy removal of leaves. The screen guard lid on the top is heavy duty but the larger holes allowed mosquitoes to enter and breed. We solved that problem by attaching porch screening to the bottom of the lid. The brass spigot works great. It is threaded which allows me to attach a short hose to fill sizable or bulky watering cans or buckets. 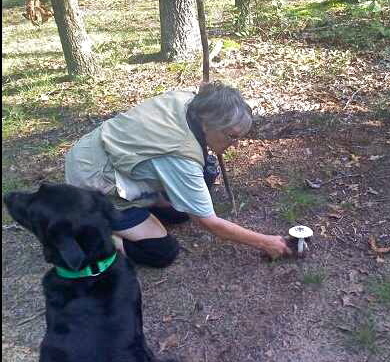 Lower than the spigot is a clean out spout, the black cap seen on the footing. It screws off for cleaning of sludge buildup. There is an overflow valve on the top rear of the barrel that we attached a permanent drain for a rain garden, not knowing if this would work or not. It works! 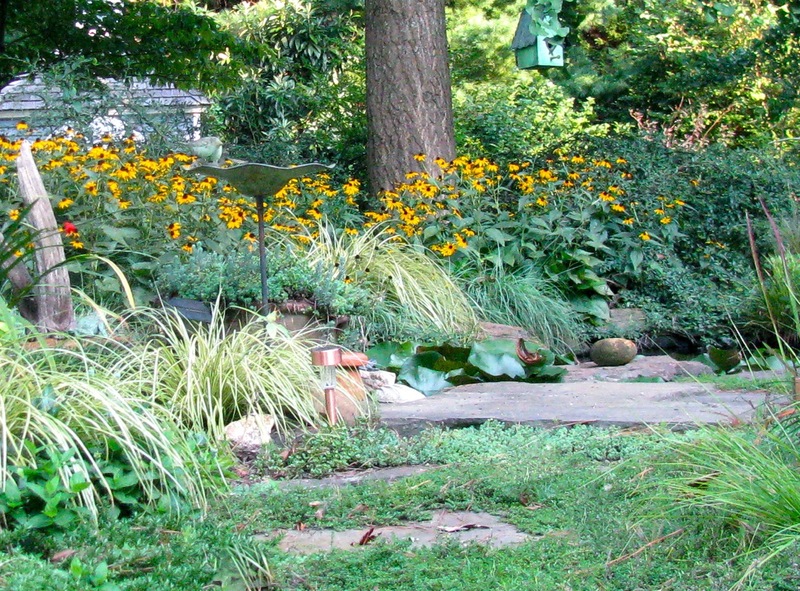 A recent 1 1/2″ rainfall filled the barrel and nicely watered the rain garden. The most surprising thing for me for how quickly the barrel filled in any rainstorm. At first, I found myself running out and checking the level. “Oooo, we have two feet of water!” But now, I just know I can fill my buckets and water those plants that need it between rainfalls. This one works so great, I do want to add more barrels. And I tell myself, it’s one small step for the environment but a giant step for our gardens. Snake in the Pond: Update! If we’re keeping score, it’s the Northern Water Snake: 10, me: 0. I would say we were evenly matched when we began battle over the pond habitat. (See “Where Have All My Frogs Gone? ) He had no fear of me and I had no fear of him. I only wanted to relocated him to a nearby snake Shangri-La but he knows very well that this little pond is nirvana, not for the fish and frogs, mind you, but for this chubby snake that grows wiser by the day. I allowed the pond to evaporate about a foot. This exposed the fieldstones arranged at water’s edge, his favorite hideaway. He could not slither in and out of the water without being discovered. I was sure I could hide the minnow net beneath the surface of the water and swoop him up when he picked his favorite escape into the depths of the pond. Nix the minnow net. He seemed to ignore it when it arrived on scene but after several failed attempts to steer him into a watery trap, he quickly learned to turn tail and hide beneath the cotoneaster if I brought out the net. At one point, I did not see him for several days. “Yes,” I thought. “I rolled up the welcome mat and he’s taken the hint.” But no, he is still here and watching me now from the shadowy vegetation. And I can only watch him from the window where I took the photo above with a telephoto lens. He’s wise to me. If I crack a door slowly, he’s gone. I still sit by the near empty pond to enjoy the fish and insects. Occasionally, across the pond, the cotoneaster branches convulse as if a wild boar is careening beneath. I know who it is and I think he’s probably caught a hapless creature in that charge. My next move should be to trim overhanging branches, sedges, and begin to remove the fieldstone, then I should remove his food supply, the few fish, but at this point I’m beginning to have nightmares that he may grab my foot and swallow me. Can a snake grow more intelligent? I know he’s outsmarted me. 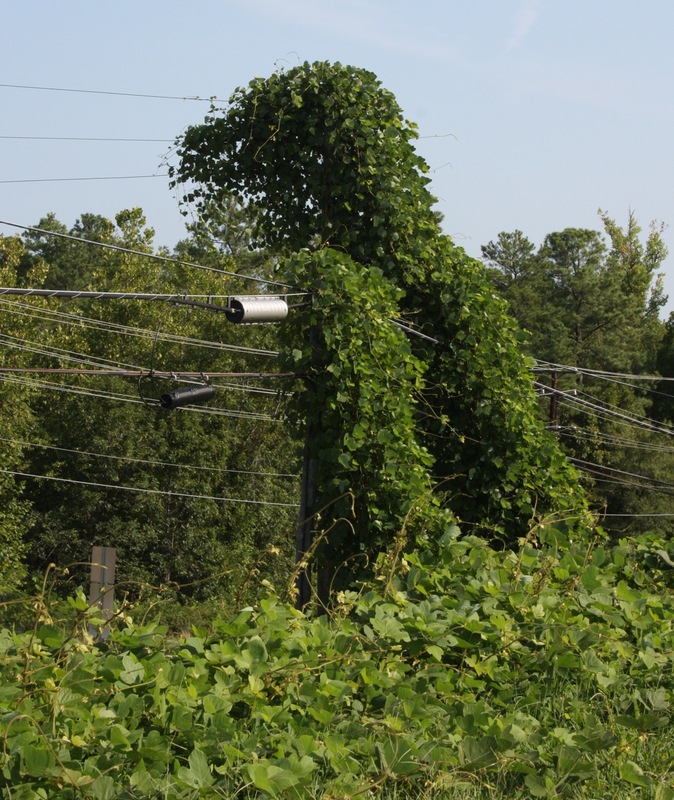 When you chance upon a roadside or field covered with this vine, eerie silhouettes of Godzillas or mighty lizards rising from the jungle floor come to mind. Silently and steadily, these creatures, concealed beneath trailing vines, mature to a hundred feet tall and infiltrate new ground every growing season. In its native China and Japan, it garners a lot more respect than we give it. Called kuzu there, it is eaten and used in medications. 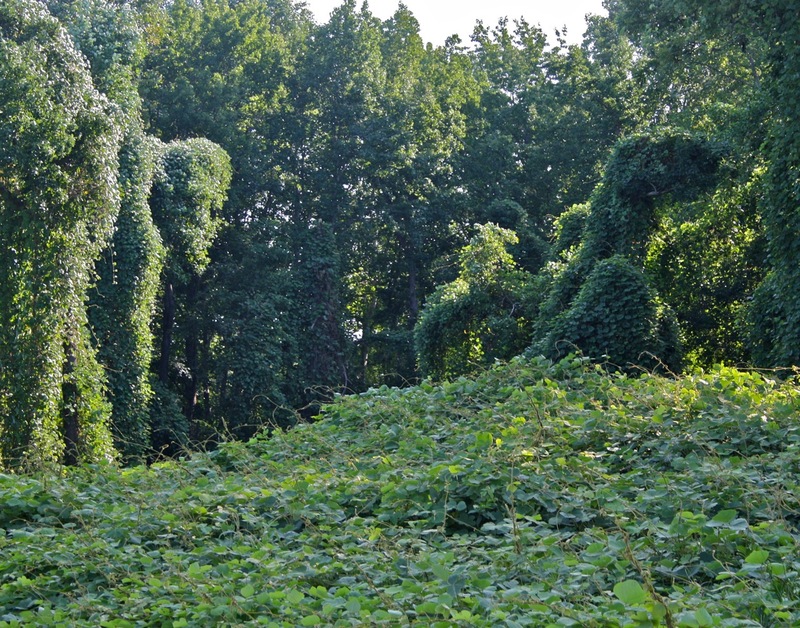 But in America, kudzu (Pueraria montana) or “the weed that ate the South,” is an extremely fast growing invasive vine, adding up to a foot of growth each day of the summer and perhaps 60 feet a season. It’s said to blanket over 7 million acres of land in the US, hiding telephone poles, smothering and killing trees and endangering forests and native habitats. Japan brought the plant to America for the Philadelphia Centennial Exposition, our country’s 100th birthday celebration in 1876, to display as an ornamental plant and a food source. Apparently the plant caught the fancy of Americans. Nurseries sold it. Farmers planted it. The CCC used it for soil erosion in the 1930’s. That was then. 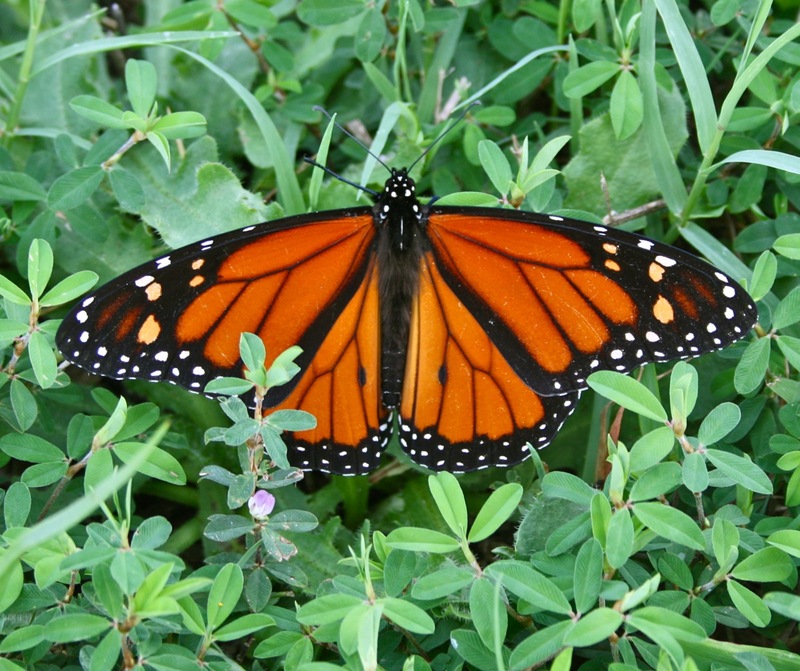 Today this dangerous invasive is spreading at the speed of around 120,000 acres a year. 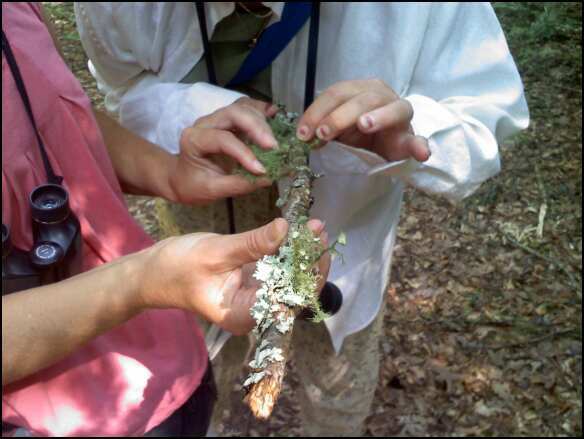 Eradication of the invasive has been difficult. Repeated herbicide treatments for up to ten years can have an effect. 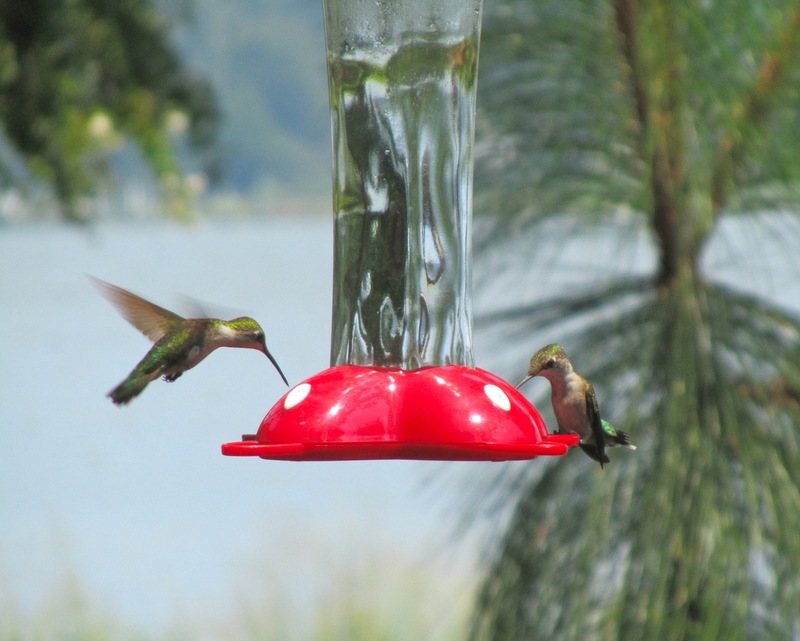 There are state and federal eradication programs but are they working? Meanwhile the vine is moving northward. 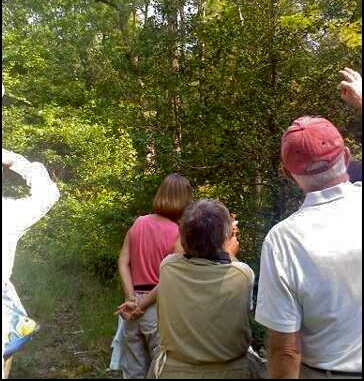 It has invaded 16 counties of Ohio, once thought to be too cold for winter kudzu survival. It’s not really armies of giant lizards but it’s still a scary nightmare. As they say down south, close your windows at night or you may be sleeping with kudzu by morning! In late summer when gardens in Virginia can look a little spent in the heat, the humidity and dry weather, beautiful Naked Ladies emerge with shades of rosy pink to electrify the drab summer garden. Whether in sun or part shade, on the hottest of days and in the driest of weather, these are ideal bulbs for planting among daylilies, hostas, or any foliage in the border. 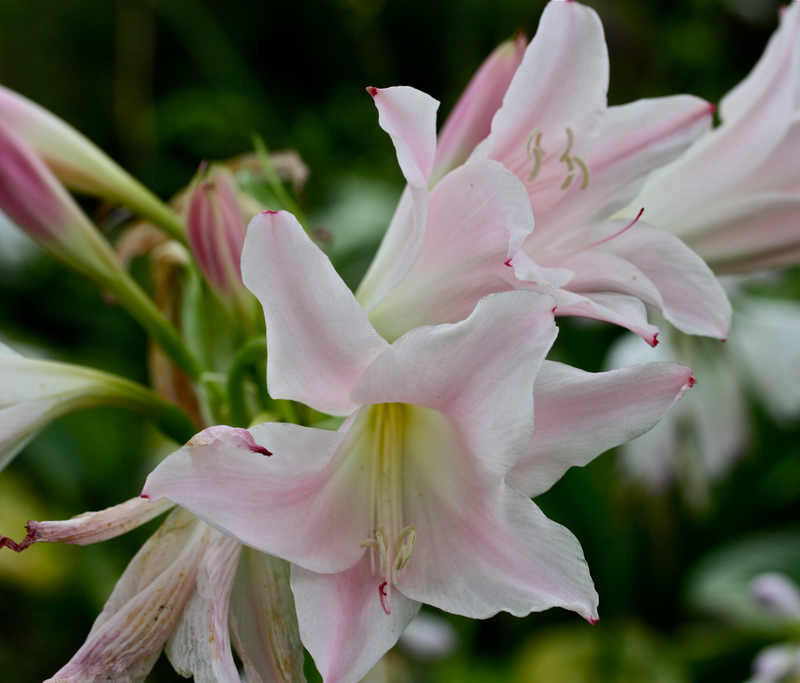 Naked Ladies (Amaryllis belladonna) are members of the amaryllis family and according to Brent and Becky’s Bulbs, are natives of South Africa. Several fragrant pink trumpet blossoms are produced atop 1 ½’ to 2’ naked stems, as the foliage has long since died back earlier in the season. 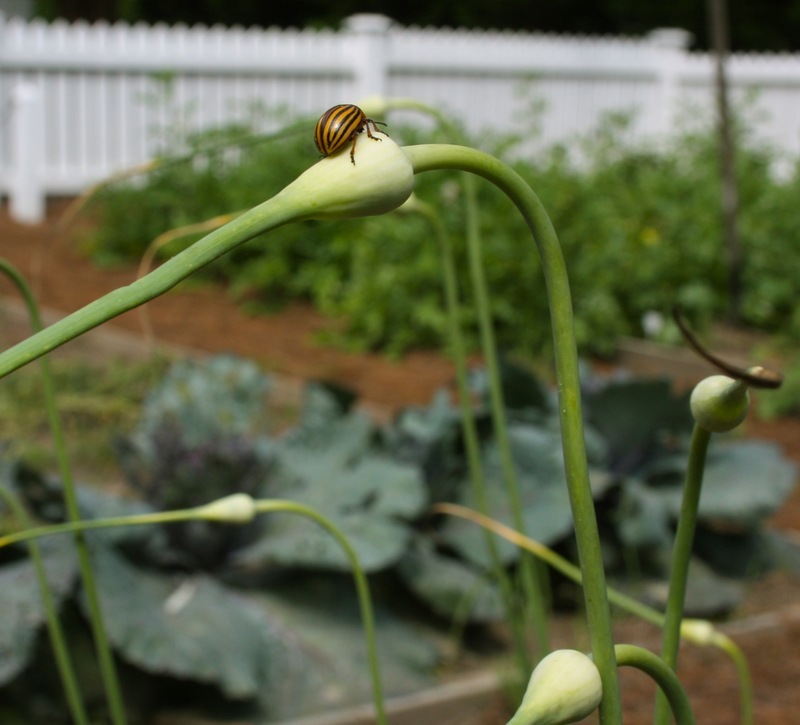 The bulb is recommended for zones 8 – 10, however with enough mulch, it can overwinter in our neck of the woods, zone 7b. My naked ladies are going strong after several years in the ground. Check Brent and Becky’s catalog website for more information on these foolproof beauties and add them to a garden near you! It’s been the summer of visits from children and grandchildren with today being the conclusion of week 6. With a houseful of children, it’s been difficult to make time for blogging and photographs so the assignment went to a 9-year old. 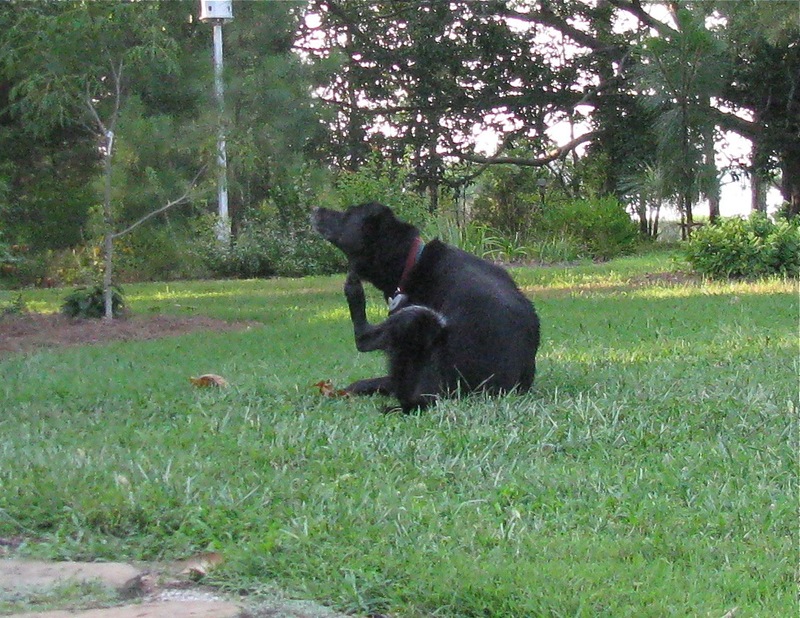 Here are his views of what he thinks is interesting in this yard…. and it’s definitely not my gardens he likes! 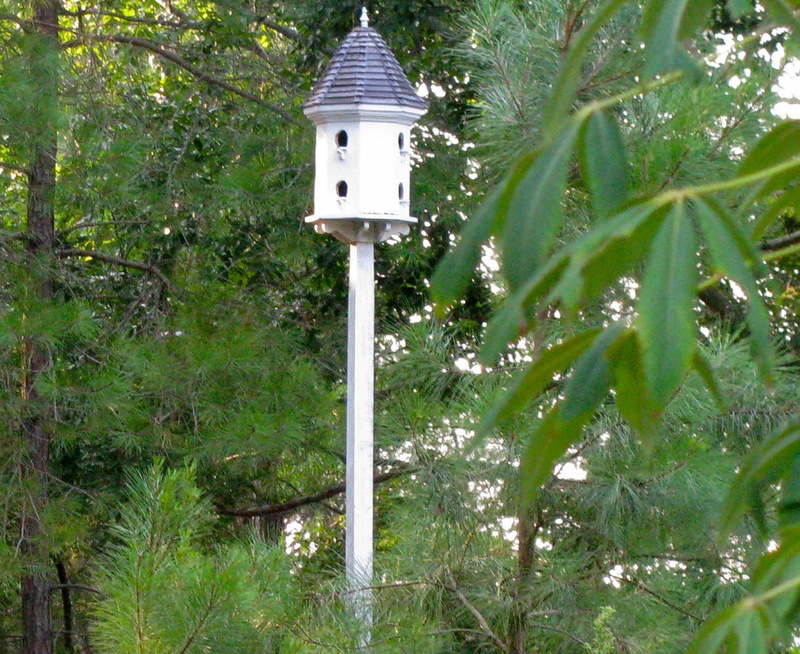 No doves in the dovecote but inhabited by bluebirds! 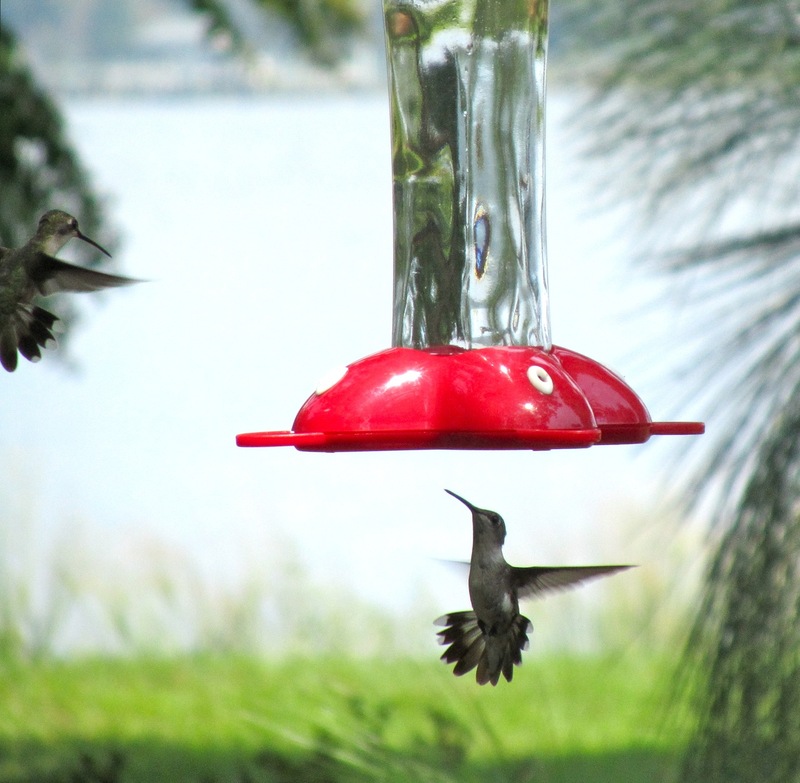 Close to 50 hummers crowd around the feeders this summer. 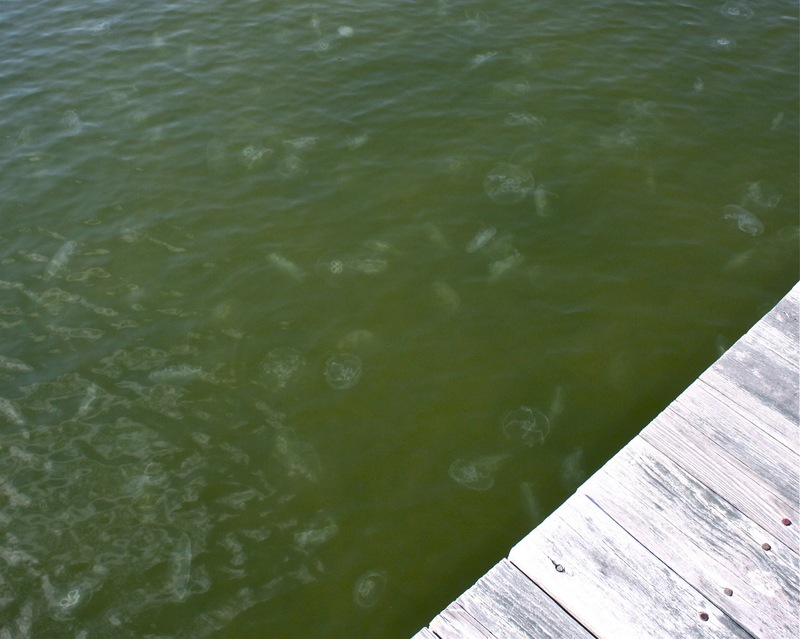 I threw this in to show why no one swam this summer! Besides the hosta, crape myrtle, magnolia, sedums, and knock out roses, what plants in my garden are performing beautifully through the drought, the severe storms, and the high temperatures of late July and August and showing no signs of stress and not a bit of stage fright? 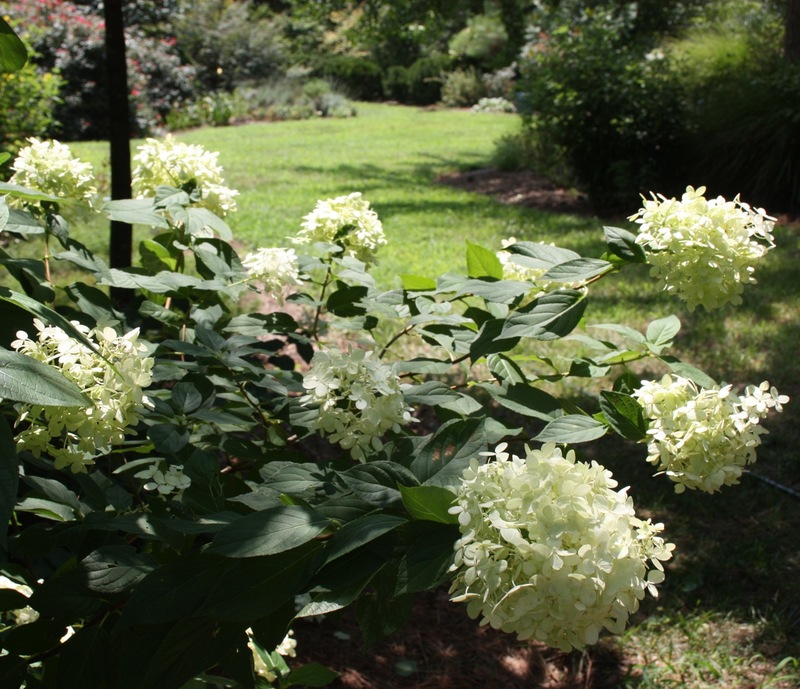 It has to be our tough, drought resistant limelight hydrangeas. After the native oak leaf hydrangeas have taken their final bow and the colorful macrophylla or mopheads have exited stage left, the stars of the late summer theater take center stage under the bright, hot lights of August. The blooms of the limelight begin as a show stopping fluffy white with a touch of green, then turn a chartreuse color followed by pink blush in the fall. In morning sun garden and in our part shade gardens, in loamy soil or not, in heat or drought, the blooms dance and sing and perform for us from dawn to dusk. 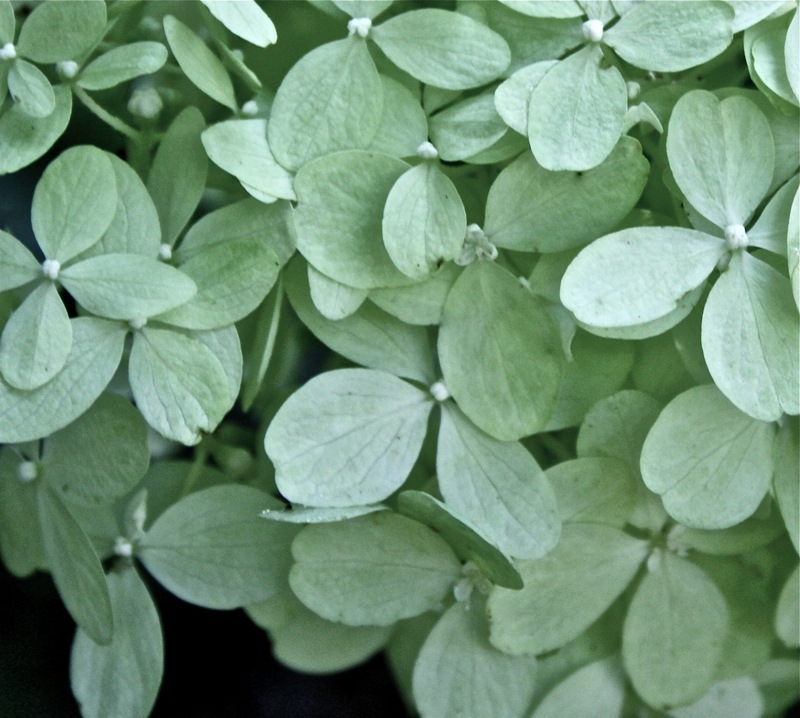 They are as graceful as a ballerina yet strong enough to hold the enormous clusters of blooms high on sturdy stems. Bravo! These wonderful performers deserve a standing ovation on a daily basis. Bloom Time: Begins in late July through first frost. Fall color: Green with a tinge of pink. Size: My 3 year old plants are 6 feet wide, 6 feet high and still growing! Soil: Prefers loamy soil but adaptable. Pruning: Best if done in late fall or early spring. It blooms on new wood. 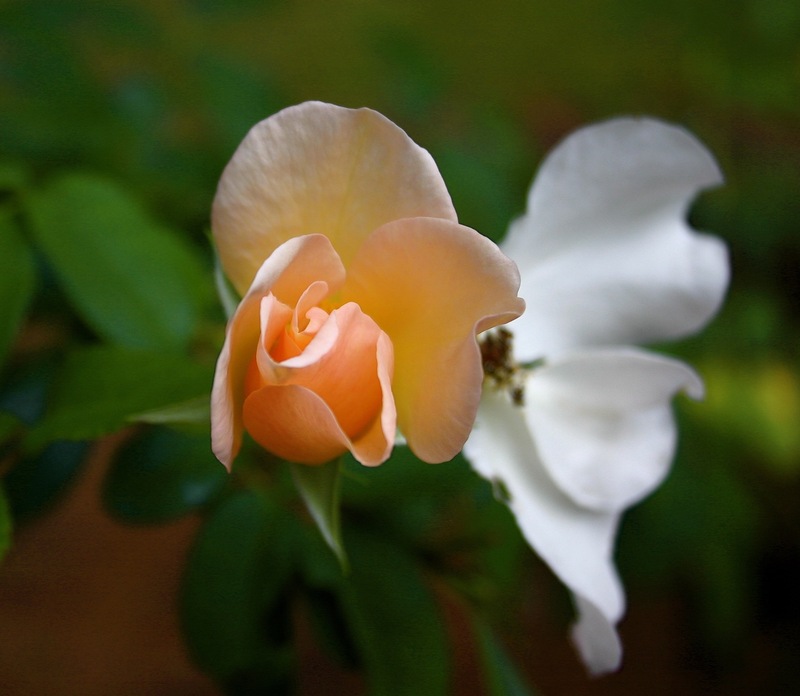 For larger blooms, it can cut back hard. Where Have All My Frogs Gone…? The answer, my friend, suns himself on the edge of the pond. It’s no longer a fish and frog pond. It is a snake pond. 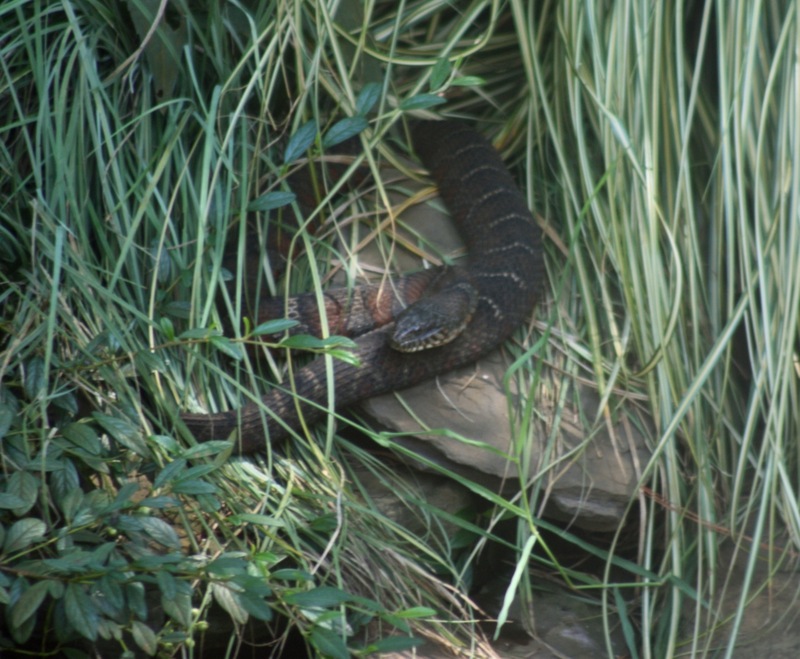 This is a Northern Water Snake (Nerodia sipedon). He’s big, he’s not afraid of me and he’s eaten every single frog in the pond. It was a couple of days later when the Northern Water Snake first showed himself, fat and content, slithering in and out of the water and dashing to hide beneath the cotoneaster. It was he in the thicket, not a bullfrog that I disturbed. All of my frogs he wore on his waistline. He has eaten every last one. A quick count of my fish tells me they are his latest victims. This week the snake no longer attempts to hide himself. Each day I stand at the pond staring at him as he curls up on the warm rocks basking and regarding me, tongue flitting, sensing his environment. His look tells me that this is his pond now. But he does not know me at all. I am already planning my strategy. This is not a snake I’d want to share the water with. 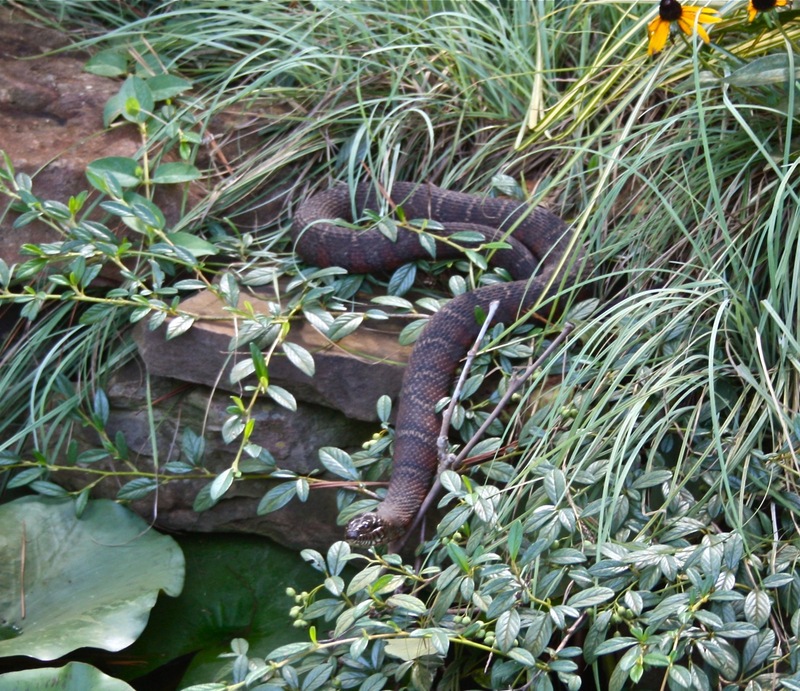 Often mistaken for a cottonmouth, the Northern Water Snake is not venomous but, like all water snakes, it can be cranky. It may charge and it does bite. It dines on amphibians and fish day and night, routinely eating fish as they sleep at night. Grrrrr! The snake is beneficial to the environment but not to my pond. I will not harm him but my game plans involve a minnow trap and/or a butterfly net. 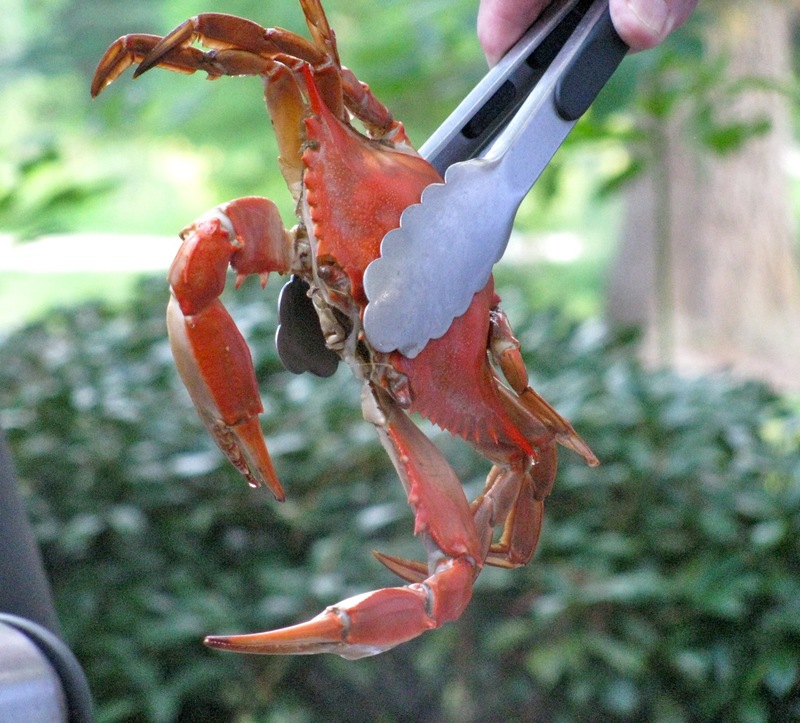 I know a beautiful lagoon about 6 miles from here that awaits this fella’s arrival. I hope I trap him soon or all I’ll have left is mosquito larvae living in the water!